As part of recent security issues i.e. Spectre & Meltdown, I got an opportunity to play around one of famous vSphere features i.e. Enhanced vMotion Compatibility (EVC) and I thought this is the right time to explore EVC vSphere APIs . I see that EVC APIs are made public as part of vSphere 6.0 release though feature itself was introduced in vSphere 4.0. Since there is lot to learn about EVC vSphere APIs, I thought it is better to divide this topic in 2 parts. These parts will be kind of tutorial on EVC APIs and at the same time, we will touch upon EVC functionality as well. Before we start exploring EVC APIs, it is important that you understand what EVC is all about & why one needs to enable it on cluster? For quick learning, I think, no better resource than this EVC FAQ KB. In short, EVC makes it possible to mix different generations of CPU servers inside a cluster, which enables vMotion across these servers. Once EVC is enabled on vSphere cluster level, it ensures that all the servers across different CPU generation exposes same cpuid bits to its virtual machines. When it comes to EVC APIs, ClusterEVCManager is the major managed object, which exposes 4 important methods as follows. Before we look into above methods, we need to get max EVCMode supported by each ESXi host to be added into EVC enabled cluster. Let us take a look at simple pyVmomi script for the same. # Below method helps us to get MOR of the object (vim type) that we passed. print host.name+" does not support EVC"
#Disconnect the vCenter server session. You could see, there are 2 hosts inside the cluster and their max EVCMode keys are intel-broadwell and intel-sandybridge respectively. We need to choose right max EVCMode key to enable EVC on the cluster. You may be wondering, can EVC modes supported per host be viewed from vSphere web client? Yes, it is, please take a look at below screenshot. Now that we have got max EVC mode per host, let us take a look at EVC API responsible to enable EVC on the cluster. i.e. ConfigureEvcMode_Task(). This API require EVC mode to be passed as parameter. To start with, we will pass max EVCMode as “intel-broadwell” and see what happens. Lets take a look at script below. Notice the line #40, where method is called to enable EVC. Right after executing above script, I looked into web client to see whether EVC is really enabled or not and below is what I observed. Error displayed above is expected since we are enabling EVC on cluster with “intel-broadwell” EVCMode, which has additional cpuid bits (CPU feature set) those are NOT available on other host inside the cluster. Since “intel-broadwell” is latest intel CPU model, “intel-sandybridge” host does not have new features available. In other words, host with “intel-sandybridge” EVCMode has all the cpu features are available on “intel-broadwell” based host but not the vice-versa, hence we can only enable EVC on cluster with “intel-sandybridge or lower EVCMode. Now before I execute above script with “intel-sandybridge” EVCMode, I powered on all the VMs available inside the cluster, once VMs are powered ON, I executed above script by editing EVCMode as “intel-sandybridge” on line #40. Since “intel-sandybridge” cpu feature set is available on “intel-broadwell”, you might be hoping that EVC will be successfully enabled on cluster. Let us take a look at web client screenshot. You could see EVC is NOT enabled again. You might be wondering why is EVC not enabled even though EVCMode is right? As error states, since cluster has Powered-ON VMs those can potentially be using CPU features, which can not be available after enabling EVC on “intel-sandybridge” mode. Reason is EVC will mask additional CPU features (from broadwell host) to have same CPU features across all the hosts inside cluster. I hope you are following. Now I powered-off and executed the script to enable EVC on “intel-sandybridge” mode. Let us take a look at below screenshot. You can see EVC is enabled successfully, isn’t it cool? Disabling EVC on cluster is fairly simple using DisableEvcMode_Task() , we have to just replace line #40 with below line. After making change as specified above, I confirmed from web client that EVC is successfully disabled. Please take a look at below screenshot. You can use Task object returned by ConfigureEvcMode_Task() & DisableEvcMode_Task() methods for tracking the task progress, any errors, state etc. Now that you learned how to configure, enable & disable EVC on cluster, let us now learn how to know what cpu features are masked by EVC, what cpu features are available on each hosts inside EVC enabled cluster. If you ask me, again it is very simple. How to get current EVCMode enabled on cluster ? 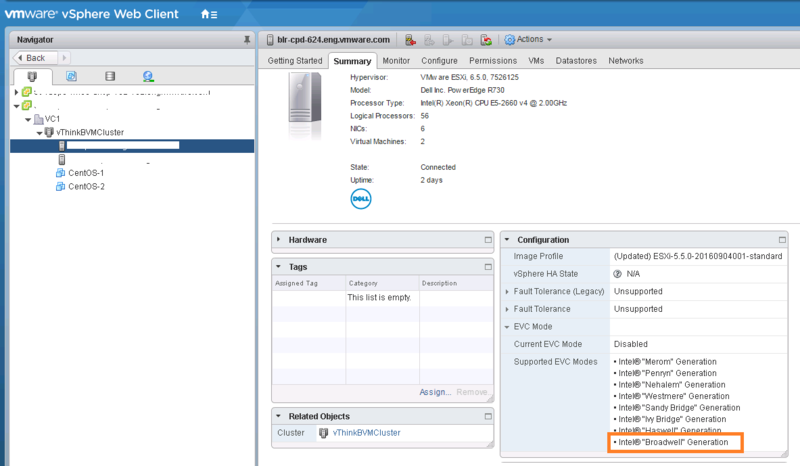 How to know whether EVC is disabled on cluster or not? How to get cpu features available & features masked on EVC cluster? All these questions are answered as part of below script. print "EVC is NOT enabled on the cluster"
That is all for Part-1, I hope you enjoyed. Update : Part-2 is ready as well, where we will explore remaining EVC APIs i.e. CheckConfigureEvcMode_Task() & CheckAddHostEvc_Task().